The TB6600HQ is a PWM chopper-type single-chip bipolar sinusoidal micro-step stepping motor driver. Forward and reverse rotation control is available with 2-phase, 1-2-phase, W1-2-phase, 2W1-2-phase, and 4W1-2-phase excitation modes. 2-phase bipolar-type stepping motor can be driven by only clock signal with low vibration and high efficiency. The module working voltage is 12~48V. it can used to drive a stepper motor. 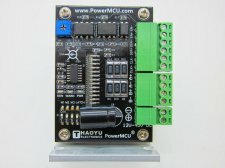 The stepper motor is suitable for 4.5A 2-phase model. The excitation mode can be selected from the following eight modes using the M1, M2 and M3 inputs. New excitation mode starts from the initial mode when M1, M2, or M3 inputs are shifted during motor operation. In this case, output current waveform may not continue. Note: To change the exciting mode by changing M1, M2, and M3, make sure not to set M1 = M2 = M3 = L or M1 = M2 =M3 = H.
The operation mode moves to the standby mode under the condition M1 = M2 = M3 = L or M1 = M2 = M3= H.
The power consumption is minimized by turning off all the operations except protecting operation. In standby mode, output terminal MO is HZ. To release the standby mode, release the condition of M1 = M2 = M3 = L or M1 = M2 = M3 = H.
Input signal is not accepted for about 200 μs after releasing the standby mode. Note: Latch/Auto mean Select a return type for thermal shutdown (TSD) circuit and over-current detection (ISD) circuit., when TSD or ISD is happen, the WARN led will work. When you get the TB6600 module. First, do not urgently to use it. There are so many stepper motor of different kind in the world. Different stepper motor have different internal resistance, so the TB6600 module adjustable output current is inaccurate. You must series connection an ammeter in the TB6600 module power. When the module is working, look carefully on ammeter, if output current is too high, close the power immediately, adjusting current to suitable.